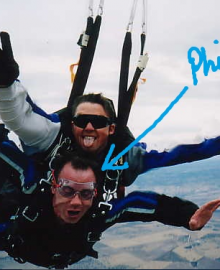 You have probably guessed by the photo that Phil likes doing things differently. Phil is a creator. The combination of a systems & human development background together with strong experiential learning experience has resulted in a unique ability to bring clarity to almost any situation in a very short time. He is both grounded & adventurous in his search for the edge. His work has resulted in association with clients both in Australia & overseas. Phil’s interest in “flow” or the “zone” began in the early 1990’s & he has consequently developed his own models which merge the latest of many mind-based disciplines (traditional & alternative). He has had extensive involvement in both ground based (fire & ambulance) & air based (aerial fire fighting) emergency service work & consequently has a strong appreciation for impact around the preservation of or loss of human life & assets. It was these experiences that originally led him to focus on Human Performance in high risk situations – to gain the very best outcome for those at risk. The desire to deliver life changing experiences then led him to focus on experiential training as the ideal vehicle to challenge & develop teams. Phil is also accredited in other psychometric tools used to measure behavioural styles. For the past 6 years, Phil has worked with Dr Noel Blundell, an internationally recognized Sports Psychologist in the development of processes & technology for measuring key performance factors for those wishing to operate at their peak. That peak performance requirement is replicated in business (from small to corporate) & as such, Phil has translated this context to that of business performance. An understanding of the latest neurological-research helps fill in much of the detail we previously have not had access to. In order to best develop the human skills in teams, Phil also presents workshops on Reading People & Influencing People. When the spotlight is placed squarely on these skill sets it is amazing how an individual can enhance their own behaviour & influence the behaviour of those around them. Phil’s presentations are both engaging & energetic. He appreciates & values the ability to challenge at all levels whilst maintaining a comfortable learning environment. Indeed, if the presentations were not challenging the stimulus for change is not present & he would consider this a waste of both the client’s investment & his time. The hours wasted in defending are better directed to opportunity & success in life. To top off his skill set & capability Phil has now become accredited as a Performance Consultant with Talent Dynamics. The profile tool & associated workshops help bring the otherwise intangible aspects of performance into a tangible form. The realization, freedom & confidence that comes from this process is immeasurable in terms of individual development, team development & business success. Phil is also about to commence a Fellowship to study with internationally recognized experts in decision making – specifically in high pressure environments. With an increasingly fast paced world & ever increasing pressures from a time, financial & relationship perspective, the last frontier of gaining the edge in business is recognizing how to best use your own & the talents of those around you. The journey is one of both individual & team development – a journey Phil is familiar with & has been part of since the 1990s. If you genuinely want change & the resulting positive impacts on your business, give Phil a call. The Talent Dynamics survey & debrief conducted by Phil Richards was accurate, enlightening & powerful. In my involvement with Phil on previous occasions he has delivered engaging & challenging presentation that ultimately result in sustained changes for those people on the programs. This has been particularly apparent on the Operational Leadership Program conducted with my company. It is now normal to expect around 25% of the participants enjoy a life changing experience that is sustained into the future. We have also committed to engaging Phil to deliver the same experience to all of our full time employees. My experience with Phil during the Talent Dynamics process has been enlightening. Prior to completing the survey online, Phil explained what the entire process entailed and what I could expect to get out of the experience. The profile debrief he conducted was extremely professional and well done. Throughout the process Phil continually checked in with me in terms of my understanding & listened intently to my comments to make sure he was on the right track & delivering the best value. I have dealt with Phil throughout my work environment for the past four years. He has devoted considerable time within our financial planning business, helping with staffing, business planning and interpersonal issues of team members. He has been instrumental in assisting us to restructure our business around personal traits rather than technical skills to ensure we have the right mix of people in our business. Phil gives a fantastic insight into the running of a business and the team dynamics necessary to run it efficiently.